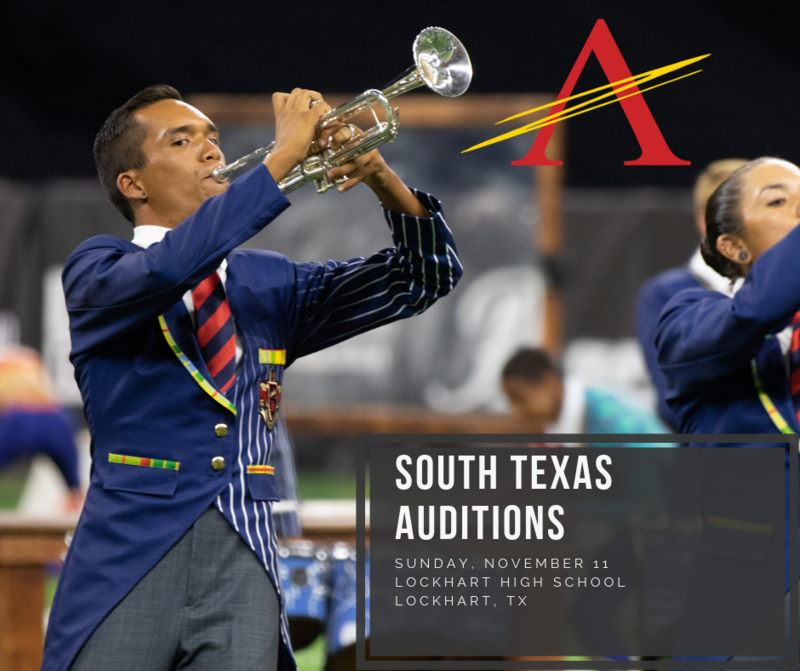 Join us at the South Texas Auditions on Sunday, November 11th at Lockhart High School in Lockhart, Texas. 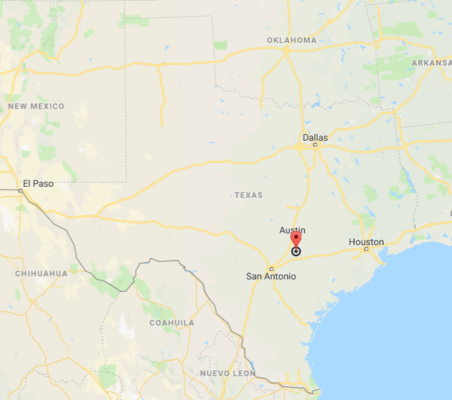 This Fall, The Academy will be hosting several remote Audition events in Southern California, Texas, Arkansas, and Florida. These sessions are designed to allow prospective members who reside a large distance away to audition for The Academy before investing in the expense of a plane flight to attend the full audition camp. Here, students will be exposed to short instructional sessions with members of The Academy staff, where they can learn more about the specifics of The Academy techniques and membership expectations. Color Guard, Brass, Front Ensemble, and Drumline performers are able to audition at the South Texas audition event. 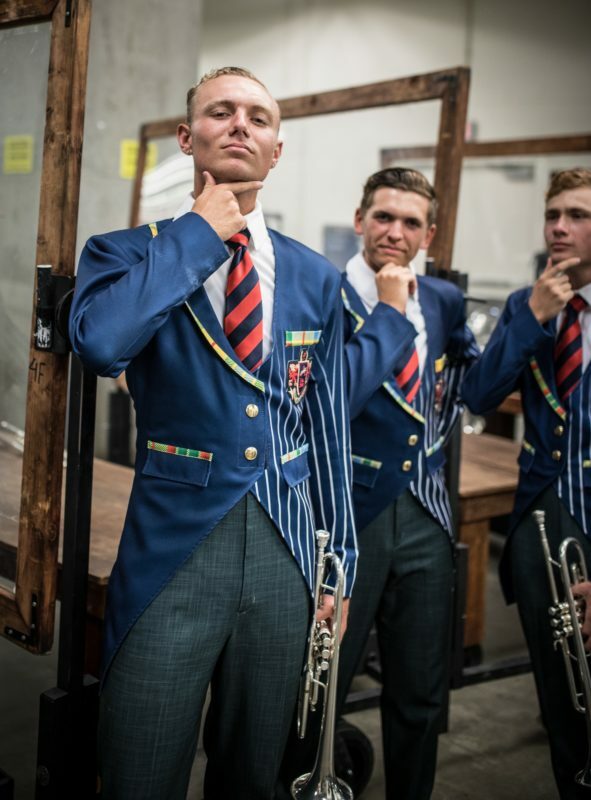 During the session, individuals who are interested in auditioning for the 2019 corps will be evaluated with a staff member and have the prospect of being offered a membership position or elevated to “Callback” status prior to the callback camp in January. Participants in these Remote Evaluation Events will need to officially register and pay for the audition event prior to attending, which will give the student access to the detailed audition materials and exercises to prepare. Each of the sessions will begin at 12:00 pm with a short meeting with introductions and some of the latest updates and news regarding The Academy 2019. Attendees will then break into performance clinics focused on The Academy techniques and audition preparation. What will the Auditions entail? 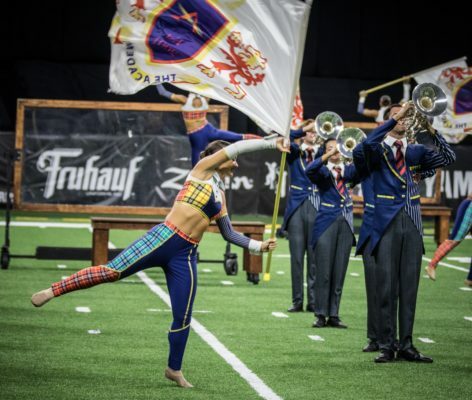 The staff member will likely ask a few brief questions about each performer’s experience, why they are interested in the drum and bugle corps activity, and why they are interested in The Academy experience. Next, the performer will demonstrate their skills on their equipment with content from the audition materials, and/or material that the performer has prepared. Auditions may be video recorded for other staff and caption heads to review at a later time and feedback from the performance will be given before returning to the group sessions. Later, the staff will determine what status to move the performer to. Notice of this assignment will typically be given by email later that week. Participants in the performance sessions should be dressed for physical activity including marching, running, stretching, movement, etc. Tennis shoes and loose, comfortable athletic clothing is required for participation. No sandals, jeans, or heavy clothing, please. Bring your own water jug to remain hydrated and arrive having had a substantial meal to last for the duration of the clinic. Drumline participants, be sure to bring your instrument, sticks, and mallets, water, and appropriate clothing/shoes. Concert Percussionists, bring your mallets with you and instruments will be made available for you. All of the musical material that will be addressed will be from the audition music made available upon registering online. Realize that your experience will be heightened the more you are able to have some basic understanding of what is in the technique book prior to the audition. So register in advance and come prepared! 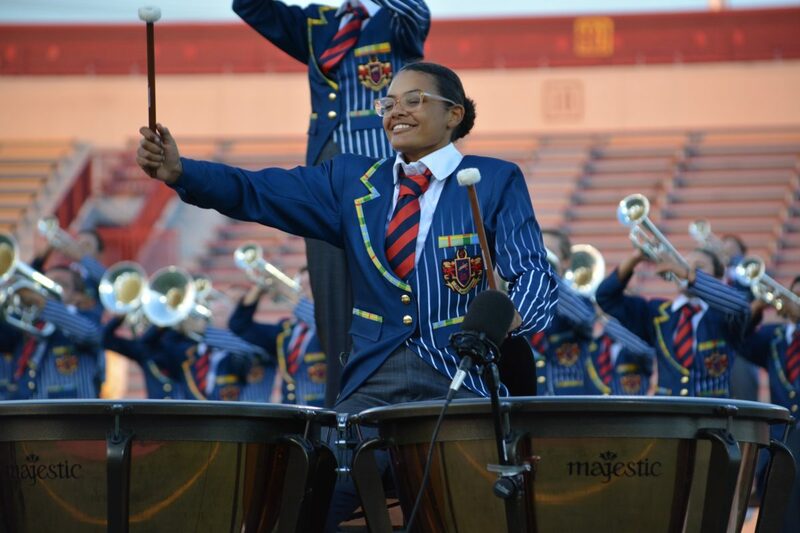 Drumline prospective members, be sure to request to join the 2019 Academy Drumline Interest Group to get your questions answered and get to know the people involved. Front Ensemble prospective members join the 2019 Academy Front Ensemble Interest Group as well. Please plan to bring your own marching instrument with you to the audition. All of the musical material that will be addressed will be from the audition music available to those who register to audition. Remember that your experience will heightened if you are able to have a basic understanding of what is in the technique book prior to the event. In addition, a portion of the session will be physical in nature (stretching, and marching, etc.). Bring appropriate clothing and shoes for exercise, and water. No sandals, jeans, or heavy clothing, please. Color guard participants will need to bring a flag & pole, as well as a rifle and/or sabre if you have one. Please wear comfortable, form fitting dance clothing. We will typically begin each session with movement and dance and then break into some form of equipment sessions for flag and weapon, depending on the make-up of the attendees. You will need something that allows you to have maximum flexibility and your feet and ankles must be able to be seen. We look forward to seeing you there! Questions? Be sure to join the 2019 Academy Color Guard Interest Group on Facebook. Here you will meet the staff and other participants auditioning, learn exercises before the event, and get a feel for what is to come in 2019! Register to Audition – Payment for registration ($75, waived for returning members) and audition event fee ($100) can be completed here. Once registered, the participant will have access to the audition materials, letters from staff, technique manuals, music, etc. 2019 corps information – get more details and updates about the 2019 corps, audition dates, location, and other info by visiting the corps web page here.